The ancestry of the Shih Tzu is fascinating, obscure and not particularly well documented. It is interwoven with myth and legend which makes it all the more mysterious and much of the breed’s history has been pieced together from ancient paintings and documents. What is certain, however, is that the Shih Tzu is an ancient breed and probably originated in Tibet. It is also rumored that these dogs were highly regarded by the Tibetans and around the 7th Century a pair of Shih Tzu was given to the Imperial Court of China. In the early 1800s the Chinese Dowager Empress Tzu Hsi, who was very fond of the little dogs, took great interest in the Shih Tzu including their breeding and care. Shih Tzu were imported into Europe about 1930 mainly into Scandinavia and the United Kingdom, the smaller Shih Tzu into the former and larger specimens into the latter. This breed can have an aristocratic appearance when standing and on the move. 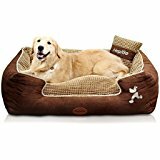 They are lively, fun-loving companions who seem to take on any persona their owners choose to give them, whether it be a pampered pooch or a fetching playmate. They love a good walk or a ball game and a decent snuggle on the couch in equal measure. They are not always easy to train as some can be stubborn, but all are creatures of habit and like routine. Shih Tzu are very happy to live indoors especially sleeping on their owners bed, but they must get outside for bodily functions and a walk or play daily is essential to maintain a healthy dog. The Shih Tzu makes a reasonable watchdog, too, because it is highly alert with extremely good hearing. It will bark at something unusual in its surroundings and, like most dogs, will benefit from obedience training to make sure that its barking is not excessive. 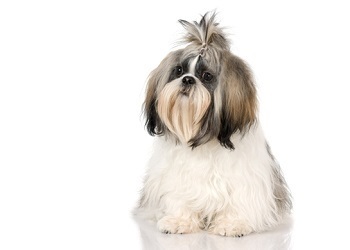 With a long double-coat and some with a heavy undercoat, the Shih Tzu is not easy to maintain. Daily brushing is required, as is regular washing and trimming. 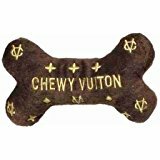 The coat is fast growing and can matt heavily if not regularly groomed. Many owners prefer to clip the coat short, especially in the summer months. It is also a good idea to check the eyes and ears daily, and it is advisable to band the hair up or cut the hair so that it does not fall into the eyes as this may cause irritation. The Shih Tzu’s flat facial structure with a short nose and being undershot can give minor problems such as snoring and after drinking their beard and whiskers are often wet. The adult Shih Tzu is great with active families with children. The baby puppy under six months is not recommended around children under four years as they can be rough when playing with any dog, and the Shih Tzu being a small breed is not sufficiently developed physically. If you want a Shih Tzu and you have very young children, best to buy an older Shih Tzu over six months of age. They all like to be touched and cuddled, but prefer gentle handling. The Shih Tzu is also ideal for singles and the elderly and will be happy to live in an apartment. Cost $800 – $1200. Common hereditary problem umbilical hernias and minor respiratory problem.